Feed the birds, not the squirrels, with this classic country-designed feeder. A weight-activated perch has 4 adjustable settings that can be calibrated so the perch closes when squirrels and larger nuisance birds attempt to access the seed. 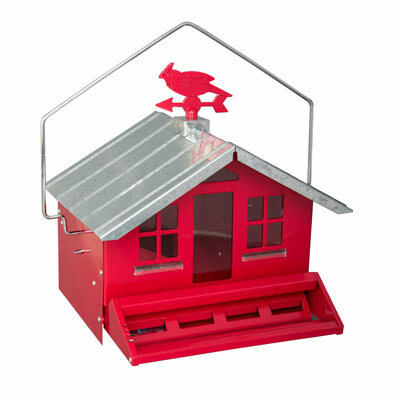 The durable, metal feeder has a removable roof for easy filling and cleaning. Holds up to 12 lbs. of your favorite seed mix. The feeder's windows provide a view of the seed level. Designed for cardinals, bluebirds, buntings, wrens, chickadees and other songbirds. Hang using the attached galvanized hanger or mount on a pole (not included). 14"H x 11"W.